How a seemingly small effort or a casual afterthought could create the defining moment of ones career is perhaps immanently humorous. A man who has been constantly admired for being a genius with an extensive legacy that includes accomplishments as a skilled architect capable of designing and building enormous structures both nationally and internationally, one would assume that his talent is quite unparalleled. Yet, while remaining the reputable architect that he was, English architect Sir Edwin Lanseer Lutyens (1864-1944), became famously affiliated with what people refer to today as the Lutyens Bench. And although recognized for many other great achievements, the identifying marker of Lutyens career seems to be firmly rooted in his design of this simple garden bench that has remained popular over the last century. His style could be identified as an Arts and Crafts design style, Lutyens being heavily influenced by the Tudors style of architecture which included elements of medieval and romantic gestures throughout his work. This style was seen as a direct reaction to a perceived decline in standards and the excessively ornate designs that were popular at the time. He mainly worked on English country houses, war memorials, and public buildings but his most recognizable project was the New Delhi, the local government building that he designed while India was under British control. He was also responsible for the Castle Drogo, the last castle to ever be built in England where he was able to use his favorite medieval and Tudor styles but with a modern contemporary approach that made his work distinguishable. Yet, with all that aside, the project that gave him the most notoriety was his project on the English country house, “Little Thakenham,” that gave rise to the now famous Lutyens Bench. The Lutyens Bench became a defining symbol of many gardens. The benches’ alluring appeal comes from the fact that the proportions are perfectly scaled paired with the unmistakable curved backing of the bench. Interestingly, there are no drawings of the bench that exist or anything that would indicate where he came up with the idea. This detail and mystery surrounding the bench creates further fascination to it while giving the impression that it cannot be known for certain how this bench came about. 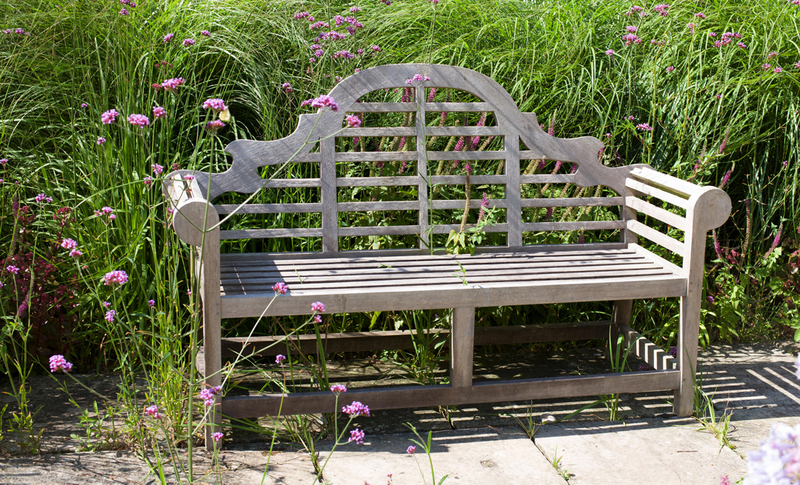 Today this traditionally designed bench has become a well-known marker in a variety of garden settings. The measurement specifics, the vertical lines, and the curved backing create the iconic shape that the Lutyens Bench is known for today. The Lutyens Bench is the ultimate sophisticated choice for a variety of outdoor spaces. Iconic for being a pioneer of garden benches, we believe this classical design can be placed anywhere you desire. Originally this bench has been mostly made from teak or oak; Teak Warehouse only uses grade-a teak wood. We offer three variations of the Lutyens bench; a full 3 seater garden bench, a smaller 2 seater bench, and the Lutyens outdoor relaxing chair. A gorgeously traditional collection, each piece can stand-alone or be used together to create a fully cohesive space. The golden honey color of the teak wood makes pairing these pieces along with other materials an ingenious way to express your design abilities. Pair it with any of our rope pieces or concrete collections for a beautiful unique space.